Nice big room and breakfast was great! Pool was nice too. 23-Apr-2019 Verified Review, stayed from Sat Apr 20 to Sun Apr 21 2019 at a $113.00 average nightly rate. We did not stay we stayed at at the comfort suites. 16-Mar-2018 Verified Review, stayed from Thu Mar 15 to Sat Mar 17 2018 at a $103.00 group rate (10% discount). "Excellent family hotel. Close to restaurants, bars and shopping areas. Great rooms and fantastic service. Great pool. Awesome vibe." "Awesome vibe. Awesome for families. Good highway hotel." Conveniently located, clean, friendly staff, and quiet. Breakfast was good with plenty of options. Newly renovated, clean, nice breakfast (bacon)! Arrived late; staff friendly and had room key waiting. Looks to be newly renovated. Clean, well-lit lobby and hallways. Room clean. We did get some noise from Interstate as we were the last room on the end on that side, but keepingg the fan running covered up most of it. Beds and sheets were comfy. Breakfat was good with egg white omelette, cheese omelette, gravy, turkey sausage and BACON (on a wednesday)! Also breads, cinnamon rolls, pancakes, oatmeal, yogurt, etc. Will stay there again when in the area! Stopped over night on our way south from DC. Nice quiet and clean hotel. the breakfast was quite good. Just north Charlotte speedway. The bed was very comfortable and our room was quiet. Easy on and off to I85. We are new Holiday Inn converts. Stressed with 2 dogs fleeing the hurricane we were treated like family. The company found us vacancy during a time of high occupancy and worked with us on check out time and extending our stay with an ever changing itinerary. Our first of many future stays. Thank you so much. Stayed here on a Friday night for a weekend get away. Check-in was quick, room was clean and up to date. Bed was very comfortable. Put air on fan so that it ran continually and didn’t hear other patrons during the night. Breakfast area was clean and nicely stocked. Friendly staff. Would return here if in the area again. Free Hot breakfast. We offer a full breakfast with many hot and cold items. We also offer healthy choices such as gluten free products. The preferred airport for Holiday Inn Express Hotel & Suites Concord is Charlotte, NC (CLT-Charlotte-Douglas Intl.) - 42 km / 26.1 mi. 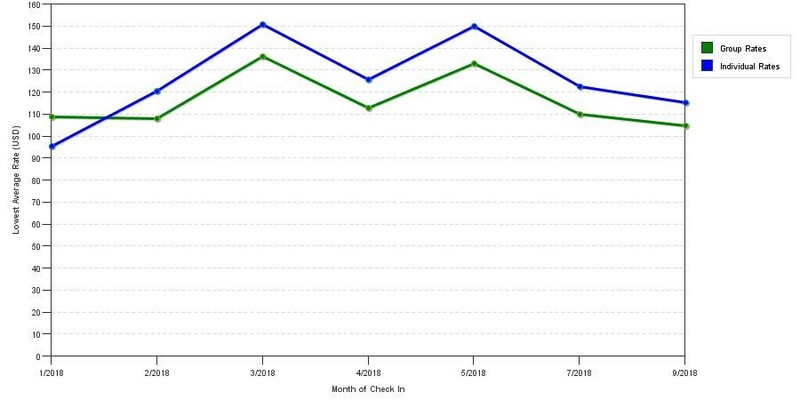 The chart above shows fluctuations of prices for both group rates and the best individual traveler prices we could find at the time the group/meeting bid was placed. The lowest group/meeting rate displayed is 20.1% in the month of July 2017 and the highest average individual rate is $150 in the month of March 2018. This chart will show past seasonality and also project future months. If you are flexible with dates, you may want to consider staying at Holiday Inn Express Hotel & Suites Concord in a month when rates are lower.